And thus, the final scheduled series 19 episode of this block has aired (because Viacom is Viacom and doesn't know how to broadcast properly, to paraphrase a certain phrase I know). 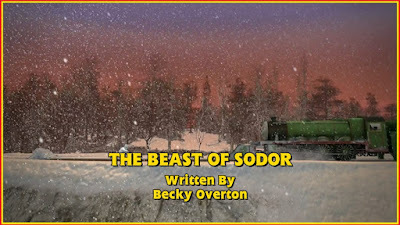 So, here's my review of The Beast of Sodor! You know, I'm kind of at my limit here. While I was perfectly fine defending Henry Spots Trouble by saying "it's for kids", I cannot do the same here. Yes, the fears like the ones on display in series 19 thus far are relatable for children, there's no denying that. But give or take a few characters, this episode has the exact same cast as Henry Spots Trouble. This is where I draw the line; there is no excuse for laziness, especially when the episode you're re-hashing came from the exact same series! Writing this episode off completely though would be a bit foolish as, in execution, there are moments here that I prefer. For example, adding Spencer to the mix really helps to push Henry's fear well, and it was good that he got his comeuppance. It does feel similar to James and Percy's dynamic in Tale of the Brave, which felt a bit more natural, but it was still rather well handled here, too. This episode also felt more entertaining than Henry Spots Trouble. The incident with the bull was a real highlight, as was Dowager Hatt. I'm glad that they're using her in Sir Topham's episodes a bit more; their dynamic is brilliant. Roads were incorporated into the episode as well, which is excellent. It's great to see the team actually take some of the focus away from the railway a bit. It's something I've been wishing for the series to do for a while and this was a good starting point. And even though, yes, it's another plot where Henry is scared, the end was actually well done, as it feels like he may start to develop from this point onwards. At least, I hope that's what the meaning of the ending is..! #S19XmasBeast This was a hilarious episode! Plus Henry grew a bit in character at the end. Spencer was great too. A great episode overall! #S19XmasBeast I was no fan at first, but now I really, really like it. Hilarious episode. I think it's the humour that saves it. Today's episode was a lot of fun to film. Fun fact: the snow was actually flour. It's still there now. Very gooey. Lost a shoe in it. No James? Oh, dear. What a shame. In case you can't tell - that was sarcasm. I've met the abominable snowman. Nice guy. Says the stories about him are quite untrue. His name is Graham. @NWRMadMan I mean, it's not like I'm the first man to forget to put his trousers on in the morning. I'm a very busy man. Another fun fact: I did my own stunts throughout this episode. I really am that great. When they said I was going to be chased by a bull, I thought it would be two blokes in a costume. My arse is still sore now. You really needn't take James to the steamworks. The scrapyard would be better. Today the abominable snowman, tomorrow Shakespeare! "Romeo, Romeo, why fart now?" It's something like that. I'd make a good Juliet, no? How dare mother call me an abominable controller! Sour-faced, stuck up, old bag! She looks like a bottle of Ribena! What a thrilling episode. It's about time I had a chance to shine. I'm available for panto this December. Book me now before it's too late! There's very little more I can add to this one. It just feels lazy as the conflict feels much too similar to Henry Spots Trouble. The cast of characters is also pretty similar, and it's really disappointing that the team would create an episode that feels this lazy. Yes, it's more entertaining, but for me, there needs to be a good balance between the two. I may appreciate it a bit more, though, if the ending actually leads to some much needed development for Henry, if not this series, the next few. At least that's the explanation I think makes the most sense. The episode itself is... really a disappointment coming from Becky Overton. I don't know, it just feels a bit lazy, if my explanation isn't true.